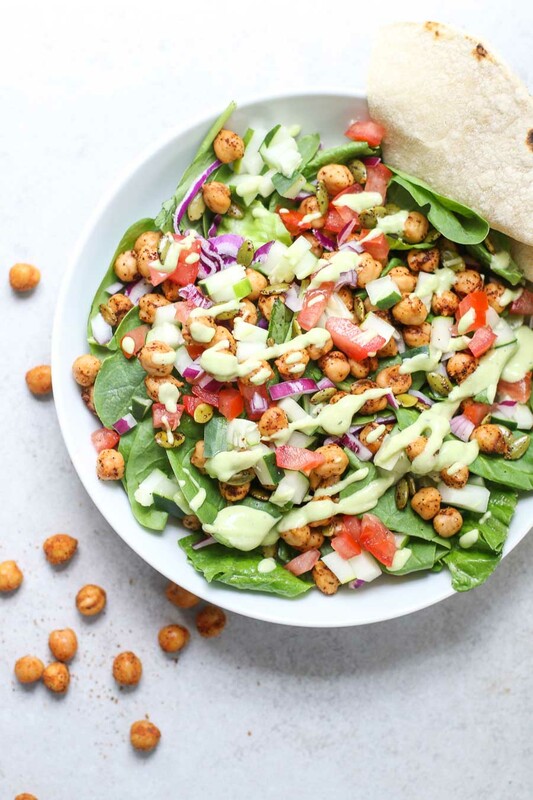 This chipotle chickpea taco salad is packed with pepitas for crunch and tossed in a creamy avocado cucumber dressing. 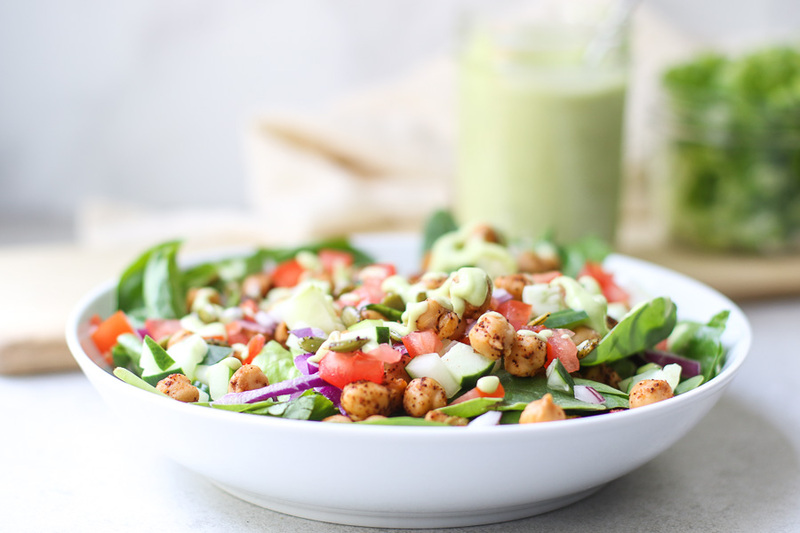 This easy vegan salad is filling and flavorful! And true to my style, this recipe couldn’t be easier to make. The ingredient list is longer than usual but it comes together fast. The first step is to saute chickpeas in avocado or olive oil with chipotle powder, garlic, and salt. You can also add a squeeze of lime if you think you’ll have some leftover from the avocado dressing. 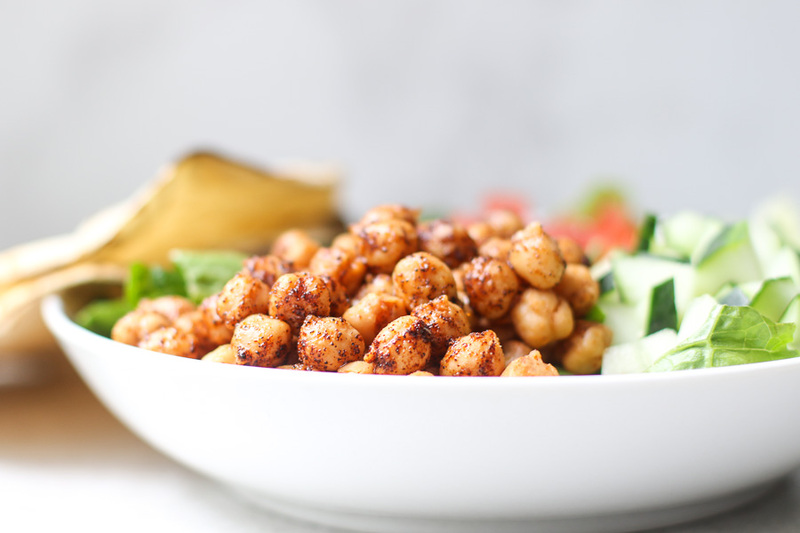 Once the chickpeas are ready, you can save them for later in the week or serve them up for a big salad to share. 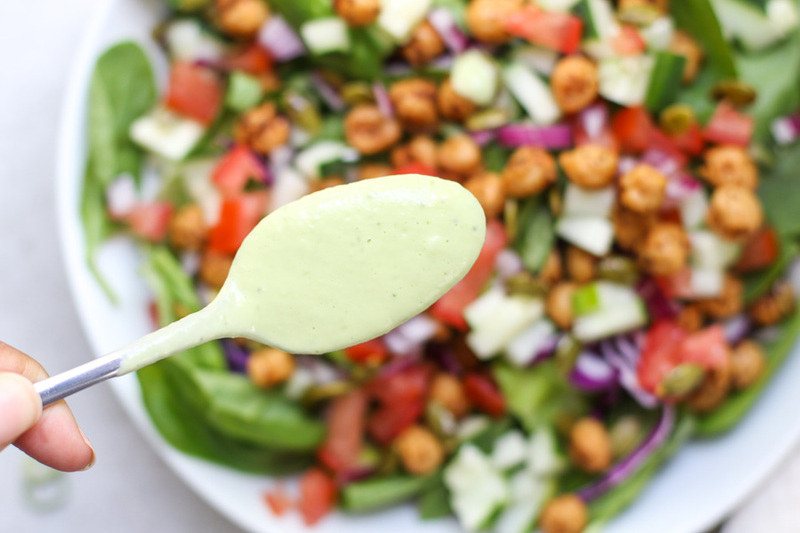 To make the dressing, you’ll combine avocado, avocado oil, garlic, lime juice, and fresh cucumber to make a creamy dressing that will help balance out some of the heat from the chipotle powder. You literally put all of those ingredients in a blender and puree. It will keep for about 3 days before it starts to brown a bit. I stretched it for about 4 days and it still looked and tasted just like the first day. Once the dressing is done, you’re basically ready to assemble and eat. I mentioned avocado oil a couple times in this recipe. It can be pricey and sometimes hard to find. If that’s the case, go ahead and use olive oil. It will work just fine. Here’s the recipe. It looks a little long but I promise it comes together in about 15 minutes and it’s worth the effort! Plus, you can always prep all of the ingredients and assemble later for salads throughout the week. 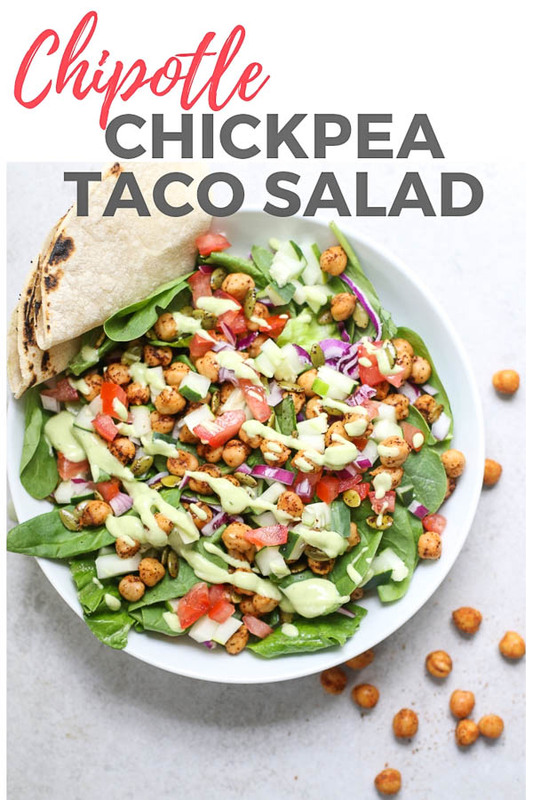 Go ahead and PIN it for later and tag me on Instagram to let me know when you make this easy chickpea taco salad! Heat a medium skillet over medium-high heat. Add the oil and heat. Add the chickpeas and sauté until heated through (about 5 minutes). Add the garlic, chipotle powder, and salt and toss to combine. Assemble the salad with the greens, cucumber, tomato, and pepitas. Add the salad dressing ingredients to a high-speed blender. Puree until smooth. Drizzle over the salad and enjoy! Love the chipotle flavoring! That dressing looks amazing aso! I never tried making a taco salad before but it looks so easy, delicious and healthy! Such a great idea for dinner! Oooh, that creamy avocado dressing looks so rich. I could drink it! This salad looks SO good! This is absolutely fantastic! So YUMMY! Is good food and this looks like one of the BEST! 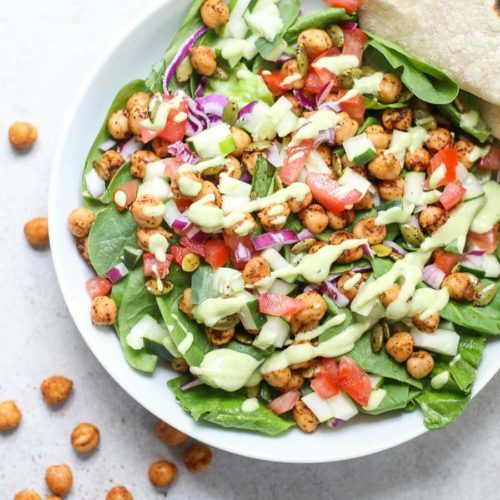 I eat chickpeas every day in salad I love them your dressing looks fantastic and I must try it I have everything so maybe today!